Martin Marty—professor, author, pastor, historian, and journalist—is, in Bill Moyers’s words, the most influential interpreter of American religion.” In Martin Lutherthis man of unswerving faith, rooted in his own Lutheran tradition yet deeply committed to helping enrich a pluralist society, brings to powerful life the devout Reformation figure whose despair for a perilous world, felt anew in our own times, drove him to a ceaseless search for assurance of God’s love. 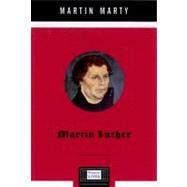 It was one that led him steadily to a fresh interpretation of human interaction with God—as born solely from God’s grace and not the Church’s mediation—and to the famous theses he posted at Wittenberg in 1517.Luther’s persistence in this belief, and in his long battle with Church leaders—embellished by rich historical background—make Marty’s biography riveting reading. Luther’s obdurate yet receptive stance, so different from the travestied image of fundamentalism” we currently face, restored the balance between religion and the individual. Martin Lutheris at once a fascinating history, a story of immense spiritual passion and amazing grace, and a superb intellectual biography. Martin Marty, one of today-'s most respected theologians, is professor emeritus at the University of Chicago, where the Martin Marty Center has been founded to promote public religion endeavors. His more than fifty books include Modern American Religion. He is a winner of the National Book Award and was the first religion scholar to receive the National Humanities Medal.